If you wash your hands as often as we do then you appreciate a soap that’s moisturizing. And, if you’re cautious with germs and aim to prevent colds and flu, then it’s ideal to have a hand soap that’s antibacterial. Jillee, over at One Good Thing By Jillee, has created a wonderful DIY foaming hand soap that both moisturizing and and antibacterial. It’s also all-natural and cheaper than buying store-bought brands. For the container, you can repurpose a foaming soap container that you already have or buy one inexpensively. 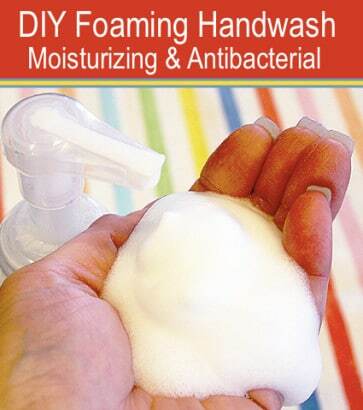 Check out Jillee instructions for super-easy foaming hand soap.